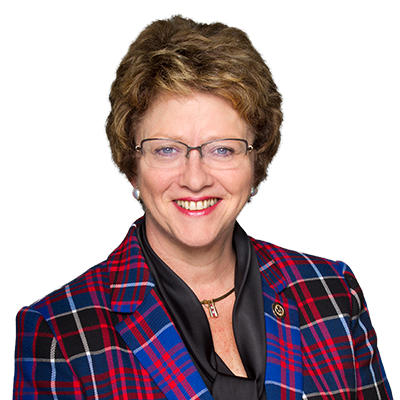 Ottawa, ON – On Friday, June 8, the Honourable Diane Finley, MP for Haldimand-Norfolk, delivered a statement in the House of Commons recognizing June as Thyroid Disease Awareness Month. The thyroid gland is a butterfly-shaped organ that is located near the base of the neck and is composed of two lobes. Its purpose is to secrete hormones that regulate your body’s growth and metabolism. It’s estimated that over 200 million people worldwide are affected by thyroid disease. Here in Canada approximately 4 out of 10 Canadians will contract thyroid disease, but only fifty percent will get properly diagnosed. Of those diagnosed, some will be hyperthyroid or overactive, which means that there is too much thyroid hormone in the body due to an overproduction caused by the gland. Others will be diagnosed as hypothyroid or underactive, which means that the thyroid gland is not producing enough T3 and T4 hormones. Still others will develop thyroid cancer, which has a very high cure rate. While all are treatable, it is vital to get an early diagnosis. Early warning signs can be in the form of sudden weight loss or gain, fatigue, nervous tremors, and a high sensitivity to heat, cold or light. If thyroid disease goes undiagnosed or untreated, it can have serious long-term health consequences. With hyperthyroid disease, this can include vision problems, fertility challenges, and joint issues. To learn more about Thyroid Disease and the side effects, visit www.thyroid.ca or visit your family doctor.